Positioning. It’s a key weapon in any good goalkeeper’s arsenal. Get it wrong as an outfield player and there’s nine others ready to step in to correct the misjudgement. Goalie’s don’t have that luxury. And Hartlepool United’s Scott Loach, as honest as they come, admits that, at times, he’s been culpable between the sticks this season. But, with a helping hand from Pools’ recently-appointed keeper coach Ross Turnbull, he’s hoping to change all that moving forward. Since Turnbull came in he’s had the former Watford man, once called up to an England squad by Fabio Capello, studying videos of one of the world’s greatest goalkeeper’s of the last decade. Turnbull won a Champions League medal as understudy to current Arsenal and former Chelsea man Petr Cech and he’s turned to the Premier League great for influence in helping Loach progress. “You’re never too old to learn,” said the experienced 29-year-old. “My game has changed since Ross came in. And it has changed for the better. “I am a confident lad anyway but I think now I am expressing myself a little bit more than I was before, which is no bad thing. “Ross has worked with the best keeper in the world at the time when he was at Chelsea and won a champions league medal. The appointment of Turnbull is just one of a string of decisions taken by caretaker Matthew Bates which has received a glowing endorsement from those within the playing staff at Victoria Park. Bringing Ged McNamee, a former Sunderland academy manager, in to assist with training and match days has also seen an instant reaction. The likes of Blair Adams and Louis Laing look transformed. Up until a month a go many Pools fans would not have picked them if the club only had 11 players fit. On recent performances even with a full squad to chose from, they’d be in on merit. It’s no coincidence - McNamee nurtured both from a very young age at the Black Cats. One player who has reacted particularly positively to recent change has been Devante Rodney. The striker was brought in when the club had grand plans. Hoover up talent from some of the Football League’s bigger clubs, give them room to grow at the Vic, and reap the rewards in the future. Some in the halls of power have even described Rodney as a “£1million player”. Now that theory is probably a bit far-fetched but he looks a hell of a lot closer to that than he did just a few weeks back. Keeper Loach thinks Rodney has got all the tools to take himself to any level in the game - and that’s from a player who sees him every day, and has graced training pitches with some of the very best from England’s golden generation. “The likes of Devante Rodney now comes on and has an impact,” said Loach when assessing the impact Bates and his newly appointed coaches have had on the squad in recent weeks. “I think he can go to wherever he wants in this game, if he keeps learning and progressing. “He might not have played all that much lately but if you look at the impact he has had off the bench it has been incredible. “He has got the world at his feet. It’s not just Rodney and Loach who have been transformed. 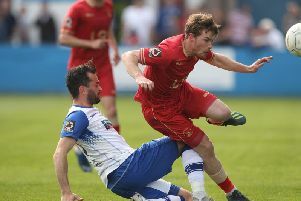 Conor Newton looks just like the player Pools thought they were signing last summer. Rhys Oates has had a burst of energy. Jake Cassidy is chasing every lost cause and even kids like Josh Hawkes, coached by Bates with the under-23s, is even shining brightly in the senior game. “Feaths is running the show now,” said Loach. “He’s always been the same player but it is just confidence. “Louis Laing is another who is producing his best week-in, week-out. “I have played with Laingy before and this is the real him, not the one from earlier this season. “He will keep growing as a player and has shown good character to get through a tough season so far. He will be stronger for it.